Sea, Sand & Sky: Treasures Galore! 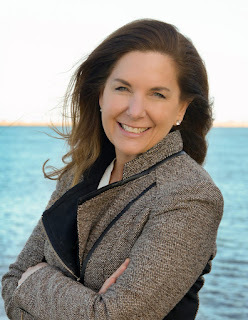 On the first official day of the Treasures of Spectacle Island on All Access Boston Harbor, right after eating lunch and looking at the rare sea glass that was found by many visitors, such as a fully intact blue bottle, we went to the 'beach' on the right side to look for treasures! David asked one of the rangers for a book about sea glass and off we went with half the campers of the Haverhill YMCA. The kids were so excited to find a treasure chest that they ran off in search for the chest, stumbling over their own feet. The book had many pictures and descriptions of sea glass and where they came from and how the original looked like. As I took a picture of David surrounded by kids, who were busy looking at the bright colors shown in the book, I spotted a weird sight by David's white sneaker. It was an ORANGE peice of beach glass! I quickly swooped down and picked it up before it left my eyesight. It wasn't just a light orange, but a deep colored orange. David flipped to the page on orange sea glass, and it said that it was one of the most extremely rare of the sea glass. 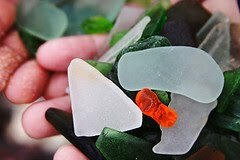 Orange sea glass was likely to be found in one in ten thousand. They were part of ship lanterns, milk pitchers, and streetlamps. I also found purple, a cerulean colored one, blue, yellow; it was like a mini-rainbow in my hand! I hope tomorrow's going to be the same as today!